How does an introvert love her neighbor? That's the question that Kendra Broekhuis--newly returned from living overseas with her husband and baby daughter--set out to answer. With humbling honesty about her weaknesses and foibles, Here Goes Nothing chronicles Kendra's thirty-day journey of stepping out in faith to pray for, meet, and love the people closest to her: the ones living in her apartment building. 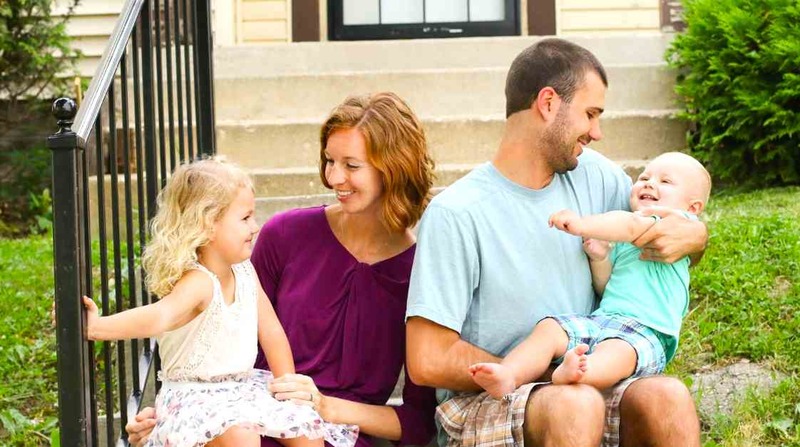 From leaving quarters for a load of laundry in the basement to baking cupcakes for the downstairs neighbors (and sneaking down the stairs to see if they've taken them) to the hard work of building new friendships, Kendra leans on God's voice in her daily life to push her out of her comfort zone. Along with plenty of self-deprecating humor about her sometimes bumbling outreach attempts, she shares her growing sense of how close God stands beside her each day. As she works from her surface personality quirks through to her hidden doubts and fears, what emerges is a heartfelt glimpse into what it's like for one awkward introvert to live by faith. Here Goes Nothing isn't a challenge. It's not a step-by-step plan to make yourself a good neighbor or an upstanding Christian. But it is the warm voice of someone who struggles just like you do--to hear the voice of God, to discern his will, and to love others with all of her introvert heart. 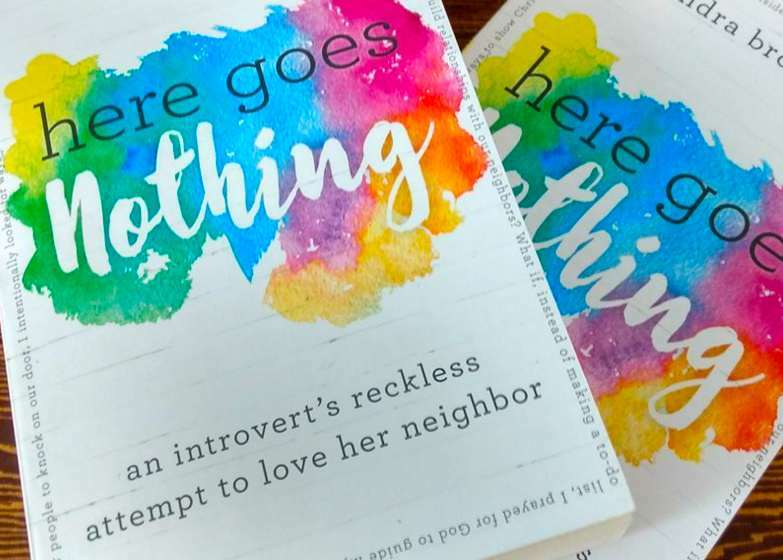 Let's meet Kendra, author of Here Goes Nothing: An Introvert's Reckless Attempt to Love Her Neighbor! How can we step outside our comfort zone? I wish there were three easy steps I could lay out there, but learning to accept discomfort in order to love the people in our everyday lives will look different for everyone. As someone who has moved many times in the past six years, I know what it is like to feel like the awkward new person who doesn't know where she fits in. And I know what it feels like to simply want to find safe spaces and people to belong to. People want to be known and feel loved, and when I dwell on that, it helps me take steps outside of my own comfort to welcome people into my daily life that I might not have otherwise noticed. So, I encourage women to pray and seek both wisdom first to recognize the people in our everyday lives (kids, neighbors, coworkers, people at church, people on the street), and then courage to engage. Maybe this means striking up a conversation with another mom at the playground. Maybe this means writing an encouraging note to the friend who has been going through a rough time. When we seek to share Christ's love, the Spirit will lead us! My faith in Christ is at the foundation of my life. Faith helps me rest in the fact that while I will never be a perfect wife, mother, or writer, I am still loved by God and covered in His grace. Faith also gives me hope for all the brokenness we see in our daily lives. Many of our neighbors have been through very difficult trials or are fighting poverty, and faith gives me courage to engage the reality of our neighborhood, while also giving me hope that some day all of this brokenness will be made whole. I have faith in Christ's deep love for me, and I try to incorporate my faith by sharing that same love with others, whether it's in real life or in my writing online. I fail, I don't ever demonstrate Christ's love perfectly, yet I know it's what I was meant to spend my minutes, dollars, and energy doing. Story behind Here Goes Nothing? My husband and I lived in Guatemala for three years as teachers at an English immersion school. We were surrounded by deep poverty, and we realized that the safe and loving world we grew up is not the same world everyone grows up in. It was both eye opening and heart breaking, and we were really changed by what we experienced. When we decided to move back to the United States, we wanted our experiences to shape our lives as a family. We didn't want to fall the lie that we were put on this earth to pursue the American Dream, but rather to learn what it means to live out the Great Commission in our daily lives. We asked our friends for advice, and they told us to start by getting to know our neighbors. We moved into an apartment in the south side of Chicago, and a few months later I challenged myself to get to know my literal neighbors. For thirty days, I thought about and took actions that would attempt to love the people living in the eleven other apartments in our building. Here Goes Nothing is the book that follows my thirty day journey, and the many awkward moments and inner thinking of my introverted brain. Major takeaways from the book? My goal is that the book will encourage readers to recognize God's "I love you's" in the everyday moments of their lives, and that they will in turn strive to be God's "I love you's" to the everyday people in their lives. Many times, what we do day in and day out might seem ordinary or mundane, but it is often in the ordinary that God is shouting that He loves us, and encouraging us to shout that same message to the people around us. Another takeaway is that we must set our fears aside when we attempt to love our neighbors. For some, like my introverted self, this means setting my fears aside of what other people will think of me, and not focusing on other people's reactions as much as my own obedience to God's commands that we love others just as much as we love ourselves. We live in a world that encourages us to fear people, but serving the God of love gives us courage to know that Christ can do some crazy things in our hearts when we recklessly step outside of ourselves as an act of worship to Him. I love 1 John 4:19. It says simply, "We love because he first loved us." This was part of the passage shared at my wedding, and it's the passage that I continually dwell on as we seek to live neighborly lives. The love that we try to share with others isn't born or sustained on our own energy, it's born and sustained from Christ's love for us! That reminder is so strengthening to me. Do you find writing therapeutic? I've often said that writing is my own personal therapy. It feels so good to process my thoughts on paper, because I am not always great at explaining my thoughts out loud. Writing helps me process whatever is happening in our lives at the moment, and over the past six years, that has included three moves, a surprising jump into motherhood, grieving the loss of our second baby, and now moving into the inner city. So, my answer to that question is definitely yes. Daily life of a writer? I tell everyone that I am a writer by night, because my day job is staying home with two of our kids. My days look a lot like changing diapers, calming tantrums, cooking meals, cleaning house, driving everyone to the library, hanging out with my mom friends, and trying to keep our freezer loaded with popcicles for when the neighbor kids come over. During my kids' nap times and bedtimes is when I do my best to set everything else aside and write. 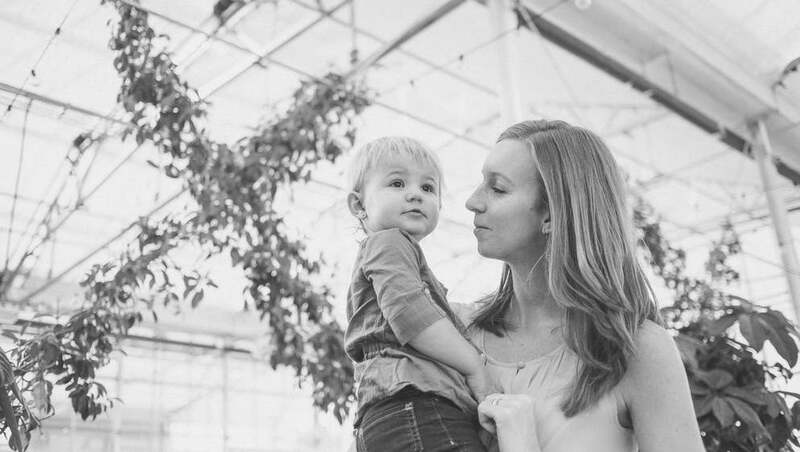 Some days it's hard to find motivation if my brain has clocked out, but my youngest recently turned one, so the sleepless nights have been fewer and far between. Do you encourage other young women to write, too? If writing is your passion, please write! The world needs more loving encouragement, honesty, and truth in it. And if your passion is book writing, don't wait for a publishing contract to fall in your lap. Start writing now, and have courage to share your thoughts and wisdom with the world around you. You never know who will be blessed by your willingness to share your life with others through writing.